The Lancet medical journal recently published three papers on low back pain, which asserted that it has increased dramatically in recent years and is now the leading cause of disability globally. The review found that most medical treatments for low back pain rely heavily on diagnosis from scans that result in surgeries and opioids prescriptions that are mostly ineffective and can be harmful. The authors called for more effective treatments through self-management and less-invasive physical and psychological therapies, including complementary therapies such as massage. Permission Joseph E. Muscolino. Manual Therapy for the Low Back and Pelvis – A Clinical Orthopedic Approach (2015). Professor Rachelle Buchbinder from Monash University in Australia, the lead author of one of the papers, said that a radical shift in thinking was required. The burden from low back pain has reached a tipping point where the condition is growing rapidly, is poorly understood and is being mismanaged medically — at cost both to the patient and to the healthcare system. In the first paper, Jan Harvigsen from Denmark and colleagues highlight that low back pain is the leading cause of disability worldwide and estimated that the disability caused by it has increased by 54% between 1990 and 2015, mainly because of aging, and the population increase in low-income and middle-income countries where low back pain is more prevalent. People with physically demanding jobs, physical and mental comorbidities, smokers, and obese individuals are at greatest risk of reporting low back pain. Disabling low back pain is over-represented among people with low socioeconomic status. Most people with new episodes of low back pain recover quickly; however, recurrence is common and in a small proportion of people, low back pain becomes persistent and disabling. Initial high pain intensity, psychological distress, and accompanying pain at multiple body sites increase the risk of persistent disabling low back pain. Increasing evidence shows that central pain-modulating mechanisms and pain cognitions have important roles in the development of persistent disabling low back pain. Cost, health-care use, and disability from low back pain vary substantially between countries and are influenced by local culture and social systems, as well as by beliefs about cause and effect. Disability and costs attributed to low back pain are projected to increase in coming decades, in particular in low-income and middle-income countries, where health and other systems are often fragile and not equipped to cope with this growing burden. * I believe that stating that there is not a “well understood cause” for most low back pain is inaccurate. And it shows the bias of allopathic, Western medicine, against the importance of myofascial soft tissues, which is ironic given that it is used in the same article where non-allopathic, complementary alternative medicine (CAM), integrative therapies are being recommended. So if we say that the cause of most low back pain is not understood, it should mean that we do not know what mechanism is causing the low back pain most of the time. But that is not true. We can often palpate tight myofascial tissue or a dysfunctional joint that is causing back pain. The allopathic world often describes any musculoskeletal (neuro-myo-fascio-skeletal) pain as not well understood if no structural damage is seen on MRI, such as a herniated disc pressing on a spinal nerve. This shows an inherent bias against soft tissue as the source for pain and dysfunction. Anyone who has been in practice as a manual therapist for any period of time knows that myofascial tissues are very often the cause of pain. And even though this paper begins to recognize that by recommending massage, spinal manipulation, and other CAM therapies for the treatment of low back pain, it would be nice if they could remove all bias, such as the bias manifested in describing most low back pain as not well understood. 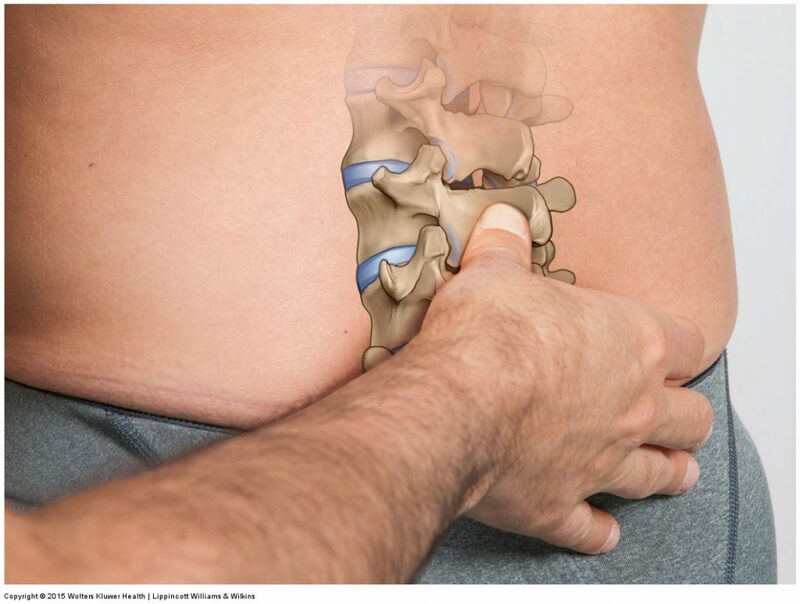 Lumbar joint mobilization. Permission Joseph E. Muscolino. Manual Therapy for the Low Back and Pelvis – A Clinical Orthopedic Approach (2015). Self-management, physical and psychological therapies, and some forms of complementary medicine, and place less emphasis on pharmacological and surgical treatments; routine use of imaging and investigations is not recommended. 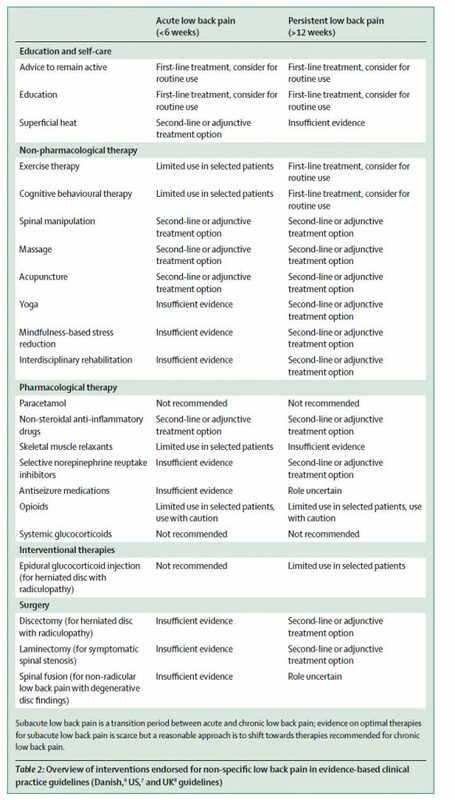 The table below from the paper lists some of the recommended treatments. The first-line of treatment is education and self-care. While spinal manipulation, massage, acupuncture, yoga, and other therapies were listed as second-line or adjunctive treatment option for acute and chronic pain in the low back. For prevention, little research exists, with the only known effective interventions for secondary prevention being exercise or exercise combined with education. Common problems are presentations to emergency departments and liberal use of imaging, opioids, spinal injections, and surgery. Promising solutions include focused implementation of best practice, the redesign of clinical pathways, integrated health and occupational care, changes to payment systems and legislation, and public health and prevention strategies.